The phrase halcyon days comes from Greek mythology. Alcyone was the wife of Ceyx, who died in a shipwreck. In her grief she cast herself into the sea and the couple were changed into kingfishers. In the northern hemisphere the breeding of the kingfisher takes place during the calm fourteen days around the winter solstice. The bird was fabled to have a nest floating far out to sea, to charm the wind and the waves, and to make the sea especially calm during that period. What happens, in fact, is that it not only goes out to sea, but across it, and finds a warmer continent on which to breed. There are 87 species of kingfishers in the world, ranging in size from the large Australian Kookaburras, weighing nearly half a kilogram, to the minuscule African Dwarf Kingfisher, which weighs only nine grams, and our own African Pygmy Kingfisher tipping the scales at only 14 grams. 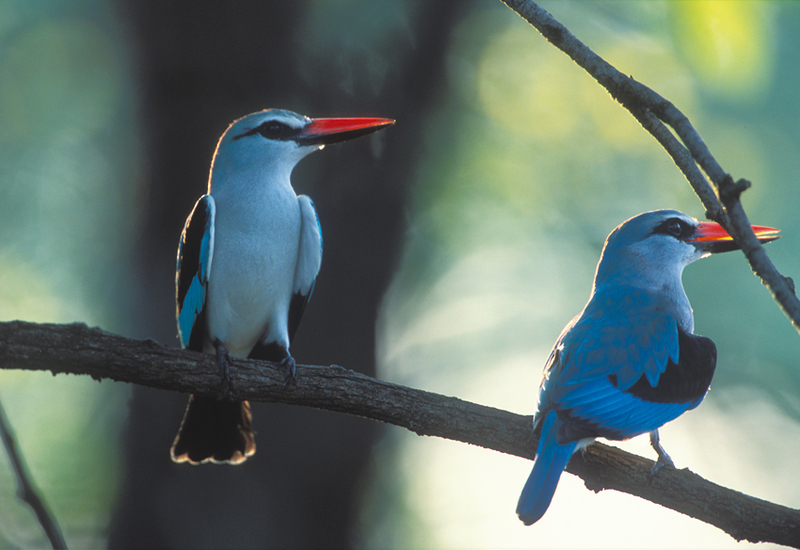 Nine of a possible 16 kingfishers occurring in Africa are found in Namibia. Except for the Pied Kingfisher, which is found further south, the kingfishers are restricted to the water-rich tropical areas along the perennial rivers in the northern part of the country. Less than half of the world’s kingfishers actually catch fish. The non-fish eaters have flatter bills, while the fish eaters’ bills are compressed from the sides. Apparently Australia is the kingfisher mecca, having 31 different species. No wonder the Aussies are so arrogant. 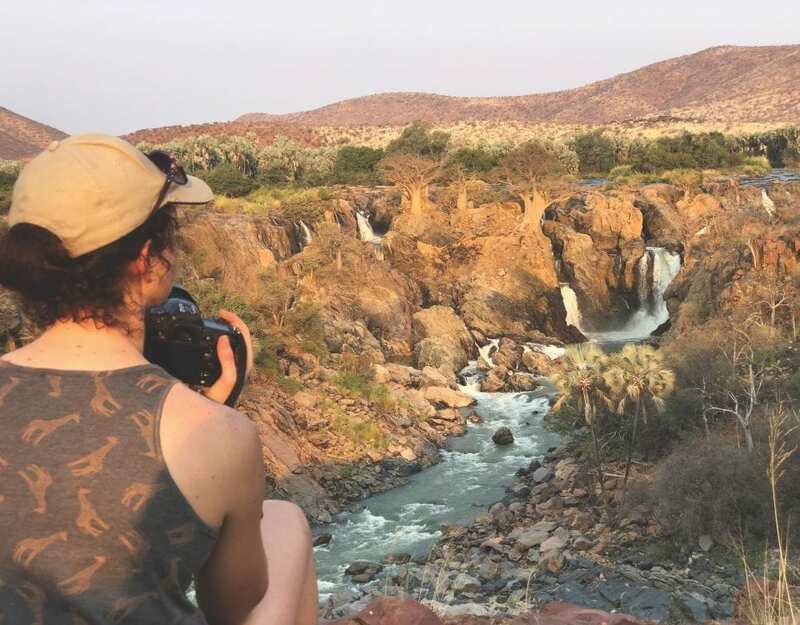 There are three genera of the Kingfisher family in Namibia: Cerylinae (Giant and Pied Kingfisher), Halcyon (Half-collared, Pygmy and Malachite Kingfisher) and Daceloninae (Woodland, Striped, Grey-headed and Brown-hooded Kingfishers). 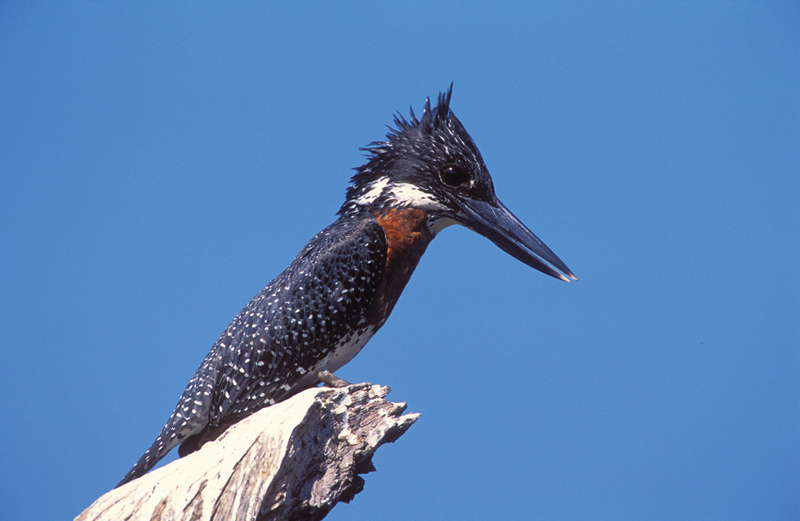 Giant and Pied Kingfishers are the two most common and widespread of the kingfishers occurring in Namibia. They are both fish eaters, and the sexes differ in both. The Giant Kingfisher, which is found in the north and north-eastern part of the country, is the largest of Africa’s kingfishers. The male has a chestnut upper breast and a white lower breast and belly, while the female has a chestnut lower breast and belly, with the upper breast white and vertically streaked with black. 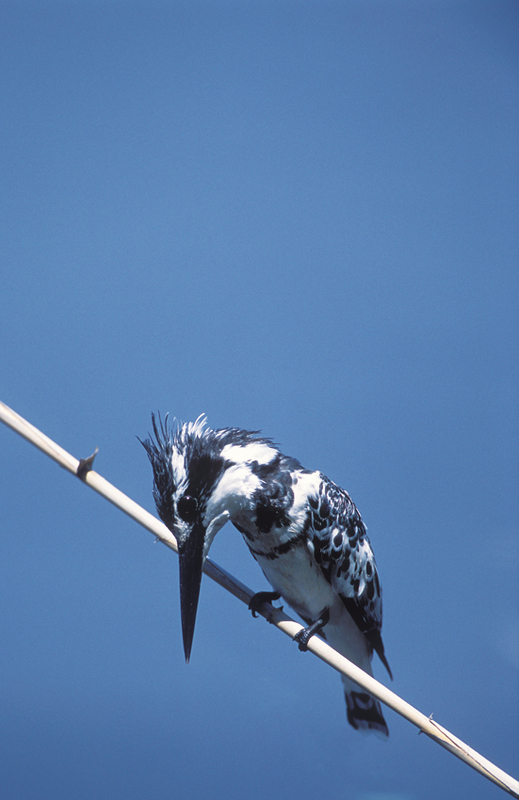 The Pied Kingfisher is a master in hovering, allowing it to hunt even at sea or far from the shores of inland lakes and rivers. The male has two completely black breast bands, while the female has a bra-like broader band that doesn’t meet in the middle of the breast. At night these birds roost in groups, sometimes of more than 100. 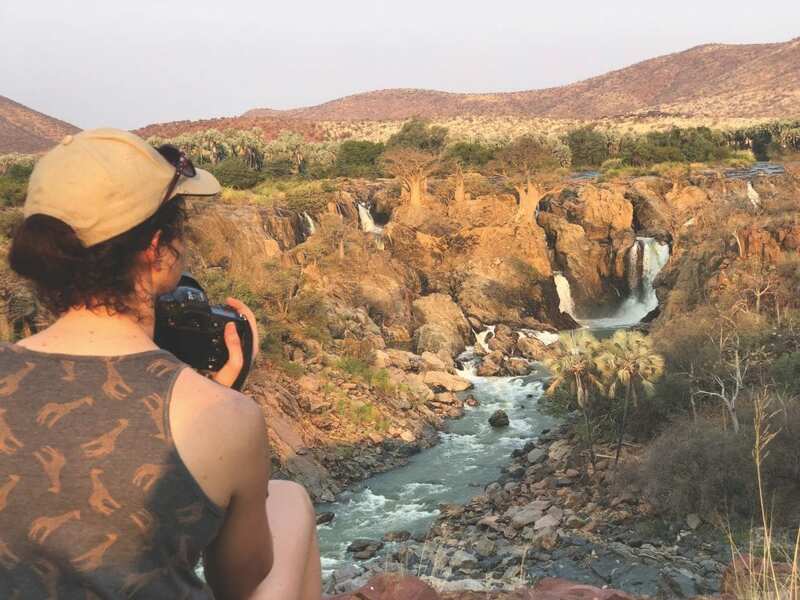 They occur almost throughout Namibia where water is found, and are therefore the most common of all the kingfishers. With the exception of the Pygmy Kingfisher, the smaller kingfishers can be found fishing from perches along the waterways. There is a legend that Malachite Kingfishers catch small insects, leaving them on the water surface to attract fish. When a fish comes to the surface for the bait, the Malachite catches it. The Half-collared Kingfisher is less common. It differs from the Malachite by having a black bill compared to the red bill. The Pygmy Kingfisher is an insect eater and also a migrant. According to research it is typical of fish-eating birds to be resident, while the insectivorous ones are migrants. I’ve not seen a Pygmy myself, but on a trip through the Bwabwata Game Park my wife claims to have spotted one, which I doubt very much, but who am I to disagree? Maybe I’ll be more fortunate next time. To say which of these beautiful birds is my favourite is impossible, probably the last one I saw. At the time of writing this article it was the Woodland Kingfisher. This intra-African migrant is highly vocal, extremely colourful and very active. When the hot weather and rainy season set in, the region’s most glamorous visitors arrive. When excited, or in courtship, they perch upright and flash their wings open for a few seconds to reveal the white undersides. This is usually done from the highest vantage point to impress female kingfishers in the vicinity. It can be quite irritating when you’re trying to photograph them. You might be fully aware of them in the distance, but they are seldom close enough to capture through your lens. The Grey-headed Kingfisher is found in the broadleaf woodlands along the main river systems on Namibia’s northern border. The blue shoulder pads are exquisite, to say the least. These summer visitors occur further west than their co-insect-eating counterparts. They have a comical way of bobbing their heads before diving to the ground to catch prey. Although they rarely eat fish, they can often be found along the edge of water where they like to take a bath in the shallows. They are also intra-African migrants. Although I’ve seen a Striped Kingfisher only once, I can still clearly remember the meeting. It was in the Mahango Game Park and only for a few seconds, but I was able to take a few shots. As with many other photographers, I still think these are very special and fantastic pictures, because the moment was so short and special. Striped Kingfishers prefer thornveld riverine forest, and are also insect eaters. 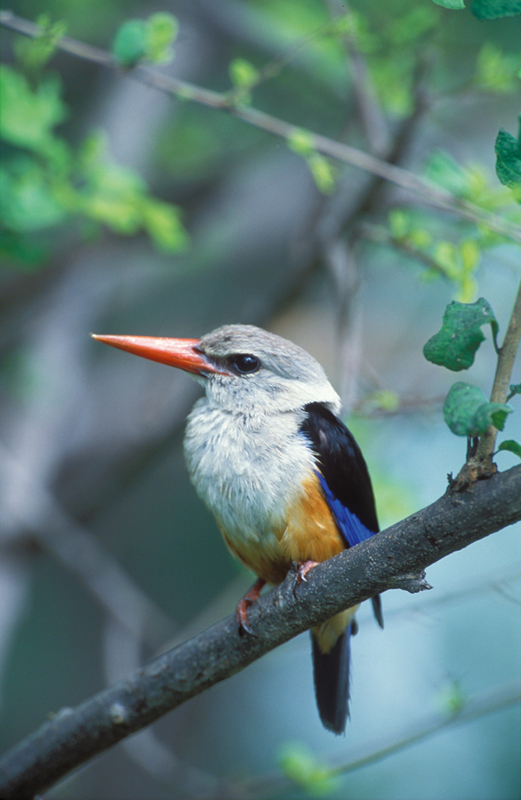 The Brown-hooded Kingfisher is a relatively common resident in Eastern Caprivi, and is often found in gardens in Katima Mulilo. Incidentally, my favourite before the Woodland Kingfisher was the Brown-hooded Kingfisher, entertaining us on our previous trip to Katima. They prefer the non-aquatic broadleaf woodland. The kingfishers are as they say in Afrikaans meer bek as binnegoed (more bill than intestines), with their huge bills and relatively small body. But who cares? I think they are one of the most spectacular groups of birds in Namibia, including the non-fish-eating kingfishers with their spectacularly beautiful blue wings. In their way the not-so-colourful, not-so-blue kingfishers with their acrobatic abilities and elegant fishing methods are equally impressive. Although a Giant Kingfisher diving into the water unceremoniously is not all that elegant, it is still very impressive. Fortunately the Malachite and Half-collared Kingfisher do give some respectability in the fishing fraternity. Apparently the one common failing in all of the kingfishers’ personalities is their lack of nest hygiene, to much so that their nests are sometimes called rotten foul-smelling holes! My only remaining question is: how can you call a family of birds kingfishers when more than half of them don’t eat fish? I suspect that these non fish-eating kingfishers were made in Gobabis.